Bring all new flavors to your specialty drink menu with this Torani sugar free chocolate flavoring syrup! It's sweetened with Splenda brand sweetener, which offers the taste of real sugar without the calories. This tempting flavor will complement your beverages without overpowering them or being too sweet, while the user-friendly bottle will be convenient for your busy baristas to use. Torani flavoring syrups are specially formulated to resist curdling in milk and to hold up well under heat, making them the perfect choice for espresso-based drinks, brewed coffee or tea, and more. Use this flavor for frappes, iced coffees, smoothies, and even baking! This syrup is great on its own or for pairing with caramel, almond or raspberry flavors! I love the selection of sugar free syrup flavors. The most variety that I've found anywhere so far. The sugar free flavors from Torani are really great. I don’t notice any aftertaste often associated with “sugar free”. Definitely stock your sugar free from Torani! Taste good, really wish I got the one with sugar but I think this taste the same. Good in shakes mixed with a little bit of Hershey’s choclate syrup, makes a great shake. Nothing beats being able to offer a sugar-free chocolate option for hot, iced and frozen drinks. Your customers won't miss the sugar and it blends in well. This is an amazing chocolate sugar free syrup. It will not tamed the place of chocolate but does a good job of satisfying a diabetics needs! Sugar Free Chocolate lets everyone enjoy the good things in life! So tasty. You'd never know there was no sugar. Use in hot or cold drinks. Never disappoints! The sugar free chocolate flavoring syrup is so tasty and very bold. The chocolate syrup is great for adding to our shakes and smoothies. The syrup is delicious. Great chocolate flavor from this one. The only complaint I have is that they don't carry this flavor in non-sugar-free. We have several customers who will not drink anything with artificial sweeteners. My husband had to have this chocolate flavor! We are on a keto diet, so we need sugar free products. We mixed this with some heavy whipping cream in the mixer and made "chocolate cool whip". It's so good! Tastes like chocolate mousse. This sugar free chocolate syrup is a easy way to make sugar free mochas, however, it is known to taste kind of like tootsie rolls instead of the chocolate flavor you normally use for mochas. I am not a huge fan of chocolate but this really helps give my shakes the flavor it needs and I asked the customers that do get it if they like it and they all say it tastes good. I love trying new sugar free syrups with my granny who is a diabetic because she loves having options to flavor her coffee. Neither one of us really cared for the chocolate syrup. It was a bit overpowering and did not go well in our coffee. I feel like it was too artificial tasting. Websturant orders are so easy to place. The product is delivered quickly and is exactually as you ordered. The sugar free chocolate syrup I purchased from Websturant was not only delivered quickly but the prices beat what I can purchase the product for in store. Thanks Websturant!!! We love to serve our morning coffees with Torani Sugar Free Chocolate Favored Syrup. Since we live in rural Arizona, WebstaurantStore is the most efficient way for us to get this product. This is one of those staple items. I use the chocolate in my protein drinks and to mix with other flavors. Great taste and the base for mixing flavors. A must have. You can't beat the taste of chocolate in the Irish Cream flavoring syrup. It can make a chocolate drink pop right out at you, just with a squirt or two of this syrup. I have about 15 bottles of sugar free syrup on my counter, and this is fast becoming a favorite. Great in protein drinks and coffee. Lovely over frozen yogurt. I ordered this Chocolate syrup because my husband said he may utilize it, but it has quickly become a favorite of mine. I use this with the English Toffee and Coconut syrups to make sweet iced coffees that satisfy my sweet tooth. It does taste enough like chocolate, though overly sweetened chocolate. It is thus consumable but the sugar free tastes much sweeter than the regular. version. Torani makes a great sugar free chocolate syrup. Some of their other sugar free syrups have a distinctly chemical / artificial aftertaste, but the chocolate does not. It goes well in coffee based drinks, but it's great with sodas as well. Love this stuff!! This one is my husbands favorite. He squirts a pump or two into his almond milk in the evenings to give him a very low calorie, before bed snack. You know when you go grazing late at night and you end up eating that thing you regret, he has found this to be the cure. Very satiating and no guilt!! It's hard to find sugar free chocolate that tastes good, but this torani sugarfree chocolate syrup is really good. We drink a lot of coffee and this has become popular with everyone in our family. The sugar free chocolate syrup is really good. I have mixed it with the sugar free peppermint and the sugar free peanut butter syrups (not at the same time) and it tastes just like a fancy coffee drink from a cafe! The Torani sugar free chocolate syrup has a great flavor and we use it as our primary sugar free chocolate syrup flavor in our espresso based drinks. We liked this syrup OK but this one did not have much of a true chocolate flavor that I was hoping for. It did come in a nice glass bottle and was wrapped very well. I will probably stick to vanilla and coconut for future orders. Oh, sugar free chocolate, where have you been all my life? All torani syrups are made with splenda and does have a slight aftertaste but it's not bad at all. Great for protein shakes! While the chocolate flavor is still sweet and present, I had higher hopes for this Torani syrup. The chocolate flavor is unnatural compared to what you get from actual dessert syrups, and it isn't anywhere near as good as the other sugar free Torani syrups I have. However the syrup is still good for your quick chocolate burst to hot coffee, iced coffee, and more. Everyone loves our product because we are using torani syrups! Great quality and cones with a variety of really good and exciting flavors! will order more! I just like be using this product to make sugar free healthy smoothies. The bottle lasts along time and the fact that it's sugar free is a plus. My husband and I love using all the Torani Sugar Free flavorings, especially in our coffee. The sugar-free chocolate is perfect for turning any coffee and flavoring mix into a mocha: coffee + chocolate = mocha, coffee + chocolate + peppermint = peppermint mocha, and so on. Yum! I have tried several flavors of the sugar free syrups since I am always trying to find new ways to maintain my athletic physique while enjoying "cheat" foods and beverages. The Torani Sugar Free Chocolate is the one I use the most! I make a hot chocolate mocha protein shake every afternoon (yes, I know it sounds weird but seriously it's the best!) I use a spoon of instant coffee for a kick, add boiling water and low cal unsweetened almond milk and mix in a scoop of chocolate protein powder. Then I add the Torani Chocolate Syrup for even more chocolate flavor and sweetness, and it's like a decadent hot mochacchino with minimal calories and no sugar! Gets me through the rest of the day with high energy and zero cravings. This is truly the best chocolate sugar free syrup, it has a great rich chocolate taste! 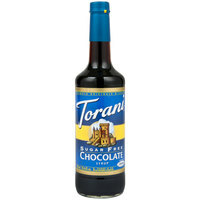 The Torani Chocolate Flavor syrup is hands down my favorite syrup both for my coffee and my morning smoothie. It is so versatile. I can mix it in with other things and it never gets overpowered or loses it flavor. It actually enhances them. Highly recommend. Best sugar free chocolate we have had! Most other sugar free varieties are very diet tasting. This one is very good. Mix it with SF coconut for awesome combo! This is the best sugar free chocolate that i have found. Love this so much. It has become so popular. My boss cant get enough of it. Such a great find and great price. I love most of the available flavors. I use these in my whipped cream charger as the sweetener and surprise flavor for whipped cream on coffee and hot cocoa. My favorites so far are the vanilla, chocolate, and salted caramel.